The Anne Boleyn Files has joined the crew of the Mary Rose, pledging to raise £500 for the Mary Rose 500 Appeal, an appeal to help the Mary Rose Trust raise £1 million to help build the new purpose-built Mary Rose Museum and complete the conservation of this famous Tudor ship with all of its 19,000 wonderful artefacts which help us to learn more about Tudor life and times. You can read more about the history of Henry VIII’s favourite warship on our special Mary Rose page, which includes photos of a few of the 19,000 artefacts that were found with the wreck of the Mary Rose along with images of what the new museum will look like. The Mary Rose Trust are very excited about Anne Boleyn (AKA The Anne Boleyn Files!) being the first of Henry VIII’s wives to become a crew member and help this wonderful appeal. 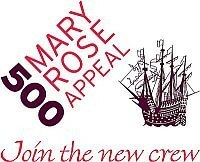 You can read the announcement of this at the Mary Rose 500 Appeal News Page. So, how are we going to raise this money? Donations – You can help us with our fundraising by going to our special Anne Boleyn Files Just Giving Page. Jewellery – Profits from the Jane Seymour All Pink Marble Necklace and Pink Marble Necklace go to the appeal – click here to see details on those necklaces. The Anne Boleyn Resource Guide – Every cent or penny from sales of our $2 Anne Boleyn Resource Guide go to the appeal. Click here to purchase and download this wonderful guide. If you have any ideas or would like to help us raise this £500 in some way, please contact claire@theanneboleynfiles.com, I’d love to hear from you.